Spacious Romantic lower floor condo with ocean views and breezes. Harts Terrace is a tastefully decorated one bedroom condo on the lower level of a private villa.There is a two bedroom vacation rental on the upper floor of this Villa. Both rentals share a common driveway and parking area with separate entrances and complete privacy from each other. It is the perfect cozy apartment set up for a couple and still feel the spacious feeling of being in a villa. The space features n air conditioned large bedroom with King Size Bed, and in suite full bathroom as well as a sitting area to relax and enjoy a movie or sports on TV. Harts terrace being nestled up on tHarts Terrace is the ideal setting for a couples vacation, quietly nestled in to the picturesque hills of Chocolate Hole on the South Shore of this beautiful island. 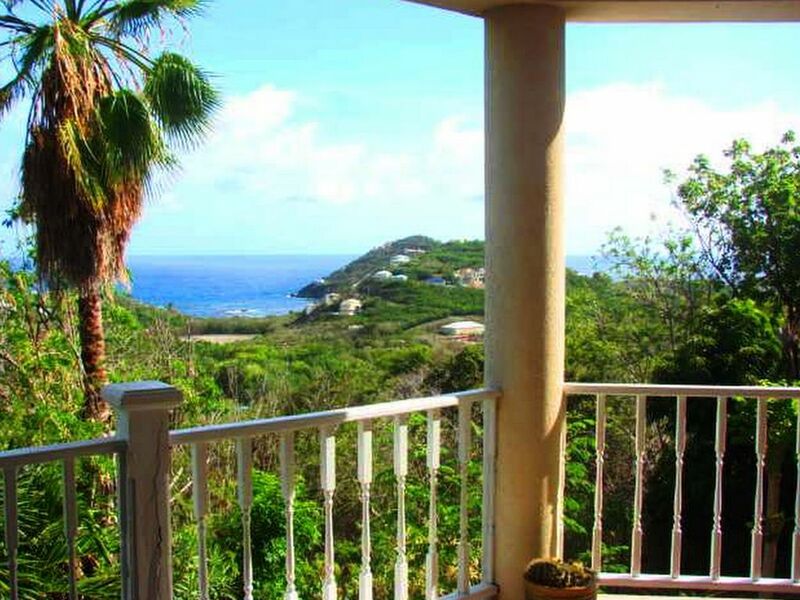 Awaken each morning to the breath-taking views of Harts Bay and St.Croix in the distance. You will enjoy all paved roads on your way to your vacation villa. Upon coming down the driveway you will experience a home with beautiful landscaping as you find yourself relaxing immediately upon entering the villa. Within walking distance of the Westin Resort, Harts Terrace is less than a two minute drive to the popular village of Cruz Bay, offering many dining and shopping options, places to just sit and relax sip a cocktail and take in the relaxed pace of Island life. The hillside offers fabulous ocean views to Hart Bay on the covered porch area where you can relax and dine while taking in the ocean breezes. A full separate kitchen is provided for preparing those laid back meals and a gas BBQ on the porch makes steaks and seafood the perfect Island treat. For a couples accommodation you won't find a better fit than Honeymoon Lodge. The spacious covered porch makes the perfect place to dine on the teak dinning table. Fabulous and convenient to town. Hart’s Delight was perfect, and I enjoyed a dip in the refreshing pool every evening. We couldn't get enough of the unbelievable View!!! Hart's Terrace had great privacy and was still close to Town and all the beaches. The bed was very comfortable and the entire place was well decorated and clean. We enjoyed being able to grill out a couple nights on the grill. The view from the large bedroom window was also priceless!! A great way to get up every morning!! Chris was extremely helpful answering all our questions in advance and giving us some suggestions on what to do while we are on the island. He gave us some ideas of places we had never been before! Once we got on the island, Abby was very warm and friendly and welcoming! We immediately felt like we were part of the island once we arrived! We can't wait to go back to St. John and Hart's Delight soon! We are already trying to work out our available dates so we can contact Chris again. Thanks for taking the time to let our guest know about your experience at Harts Terrace. We are glad to hear you are looking forward to returning to stay with us again in the future and we look forward to serving you as well. Wonderful place to stay at while in Saint John. Our host was very attentive and responsive to our emails and texts. The place was clean, neat and nicely decorated. Highly recommended. Thank you for taking the time to write a review regarding your vacation on St.John at Harts Terrace. We are so please to know that you found the accommodations to your liking and that our manager Abby was attentive to your needs. We hope that we can have you return to visit us again in the future. We came post-hurricane and realized things wouldn't be normal. But we still had a great stay and would come back to this house again. Chris on the front end was very helpful in answering questions and getting us ready. While there, Abby was extremely helpful in providing local advice and getting us acquainted. We couldn't have been more pleased with her help. The view is great. Location is close enough to town to get supplies or go out. We would rent again. Thanks for such a great stay and if you are thinking of going to St John, I highly recommend going now. Post hurricane there is plenty of damage, but the people are excited to have tourist coming back and you'll have the beaches and restaurants to yourself. The property was more impressive than advertised and the service provided by the Owners and Property Manager were second to none. Thanks for taking time to let our guest know you enjoyed your time at Harts Terrace. We glad to know you we impressed with everything. Hope to see you again in the future. For our first visit to St. John we were looking for an easy, laid-back experience, and Hart's Terrace was exactly right. This house is in a quiet mountainside neighborhood, about a mile and a half from town. The unique style of this 2-family villa is easy to adapt too. The house is divided, lower unit is very quiet and private. There was a young family upstairs during our stay, and we rarely saw or heard them. My husband and I are morning people - we have fond memories of lazy breakfasts out on the terrace, surrounded by greenery, listening to tropical birds and gazing down the hillside to the ocean at Chocolate Hole Bay. We drove our jeep easily from this location to all destinations on the island. The balmy weather was perfect in February, allowing us to snorkel seven different beaches within the national park during our week. We stocked the kitchen from nearby Starfish Market (beware, groceries are very expensive). We bbq'd a few meals, and enjoyed several fantastic dinners out at restaurants recommended by Sinbad. Unique plus: the terrace is essentially an "outdoor living room". You walk thru it to get to the kitchen, you eat meals out there, you sit out there to relax. We loved it. (Wear bug repellant at all times.) Things to note: the stone stairs down from the driveway are steep and a bit difficult to navigate at night. We also noticed that the upstairs unit has exclusive access to the pool. There is a connecting staircase, but this lower unit is gated off from its use. Perhaps there could be "shared hours" when both families could use the pool. In summary, Hart's Terrace was a lovely place from which to explore beautiful St. John! We are so happy to hear you enjoyed your vacation on St.John and at Harts Terrace. We have added additional lighting to the stairway to make it easier to navigate, thanks for your suggestion. As we do not advertise Harts Terrace as having a pool, I hope you can appreciate that these are two separate rentals and that privacy is our first priority for both parties. When the upstairs (Harts Delight)is not rented we do allow guest renting Harts Terrace to use the pool. Thanks again for taking the time to write a review. Most guest come to St.John to relax on our world class beaches in the National Park which includes 2/3 of St.John. The North Shore features a different beach every mile along the 11 mile shore line. Pack a cooler of food and drinks and relax with your friends while you forget about the hectic schedule you left behind back home. Although this is a one bedroom house, we can provide a King Size blow up bed for up to an additional two guest. As well be can provide a Pack-N-Play for infants and toddlers. $50 per person per night over two persons.